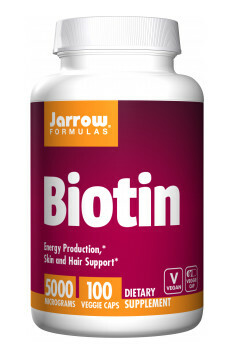 Jarrow Formulas Biotin is a dietary supplement which provides biotin (vitamin H or B7) in the amount of 5000 mcg per capsule. Biotin participates in transporting carbon dioxide in the reactions of carboxylation - it is a component of important biotin enzymes, such as: pyruvate, acetyl-CoA, priopionyl-CoA and methylcrotonyl-CoA carboxylases. Carboxylases are essential enzymes that participate in many important biochemical processes, e.g. in the reactions of gluconeogenesis, fatty acid synthesis or Krebs cycle (the process of cellular respiration). Biotin also takes part in the regulation of the cell cycle, biostimulating key proteins of the cell nucleus - it causes cell growth, gene expression, glucose homeostasis and DNA synthesis. Moreover, it supports thyroid functions, affects the normal functioning of skin and hair and, together with vitamin K, participates in the processes of blood coagulation and creating bone structure. It also plays a role in glycogen synthesis and the production of hormones and cholesterol. Vitamin H deficiency contributes to an elevated level of cholesterol, increased activity of sebaceous glands, hair loss and splitting nails. The deficiency symptoms are also skin lesions (rash, inflammations, epidermal scaling, discolouration), inflammatory lesions of intestines, depression, apathy, drowsiness, anxiety, hallucinations, muscle pain and skin hypersensitivity. Skin lesions and hair loss are caused by distorted fatty acid metabolism. Biotin deficiencies are cured by proper supplementation, and the results of the therapy are visible as soon as after several days. One of scientific studies, conducted on 33 persons (15 healthy ones and 18 with type 2 diabetes), demonstrated that an 18-day biotin supplementation (in the amount of 15 mg per day) significantly reduced the level of triglycerides and VLDL (very low-density lipoprotein) in both groups of subjects, which makes it a potential agent for treating hyperlipidaemia and preventing cardiovascular system diseases1. To sum up, Jarrow Formulas Biotin is a dietary supplement recommended for improving hair, skin, nails and mucous membranes, supporting mental health and nervous system functions, as well as preventing atherosclerosis. 1Revilla-Monsalve C. et al., Biotin supplementation reduces plasma triacylglycerol and VLDL in type 2 diabetic patients and in nondiabetic subjects with hypertriglyceridemia. Biomed Pharmacother. 2006 May;60(4):182-5. It is not recommended to use this product with a meal containing raw egg. Raw egg contains a protein called avidin which binds biotin. It hinders its absorption by the body. Boiled / fried egg does not cause such problems.